PoPville » Dear PoPville – Advice on Helping the Homeless? Dear PoPville – Advice on Helping the Homeless? 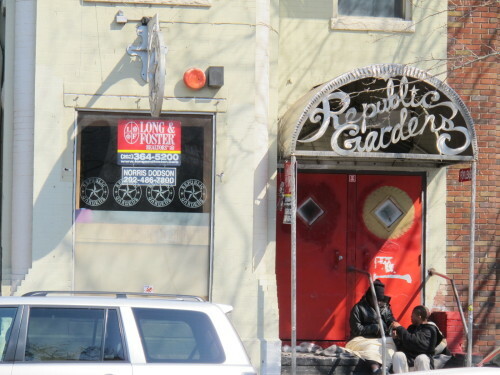 I live on U Street between 14th and 13th and regularly walk past a homeless woman whom has made the stoop for the former Republic Gardens nightclub her hangout spot morning, noon and night where she congregates with other homeless, boozes, and asks for change. She also uses the alcove next to “her” stoop as her personal restroom, resulting in a constant and nauseating scent whenever you walk past. On occasion the walk from the stoop to the alcove is too much and she will just urinate where she sits. In recent weeks she has been an even more frequent fixture at this locations. While I realize that homelessness and public urination (among other things) isn’t a new problem or even one unique to this location, it is without question disgusting. Apart from notifying the police, which has proven useless in the past (I once informed a nearby officer that she was hammered and vomiting all over the stoop and sidewalk and he said “oh you mean [Susan], not much we can do about that”), is there anything else that can be done? This has to be a public health issue…right? She disappears for a few days from time to time, which I assume is when she either finds a new spot temporarily or is admitted somewhere but I suppose the allure of U Street keeps calling her back. Is there something that can be done as a more permanent solution? Has anyone had success with DC’s Homeless Services? Reader Scuttlebutt: Cigar Bar Coming to 3622 Georgia Ave?